Cannot be cut down smaller than 6.5" X 8.5"
Our Q6 stock hairpieces for thinning hair are great because they have a French lace front with Poly sides and back. These French lace hairpieces for thinning hair are totally breathable so it’s great if you live in a warm climate. The Poly sides and back make these hairpieces for thinning hair easy to tape and clean. 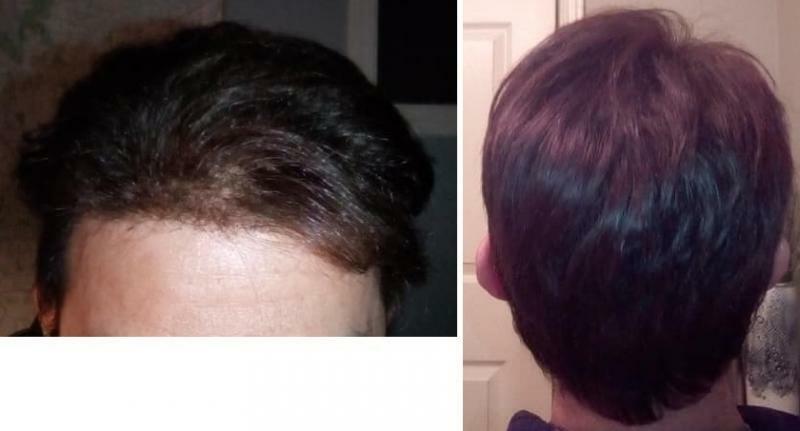 These mens hair pieces for thinning hair look natural because of the graduated, bleach knot single hairline. These hairpieces for thinning hair have durable double knots on the rest of the base. The base size of these mens hairpieces are 8"x10" which can be cut smaller prior to shipment and we also provide a professional cut in service. Immediate shipment after payment ensure you receive our mens hair pieces within 5 working days. Below are the specifications of the model product. 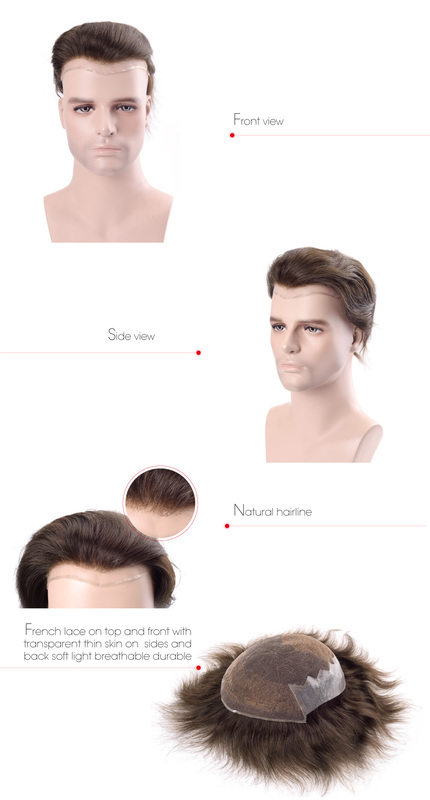 Soft, feather light, breathable, durable, bleach knots on top and front makes undetectable front hairline and top view, natural looking and beautiful appearance, transparent thin skin on sides and back make it easy to attach and clean. Please note that the above-shown pictures are for general reference and idea only. 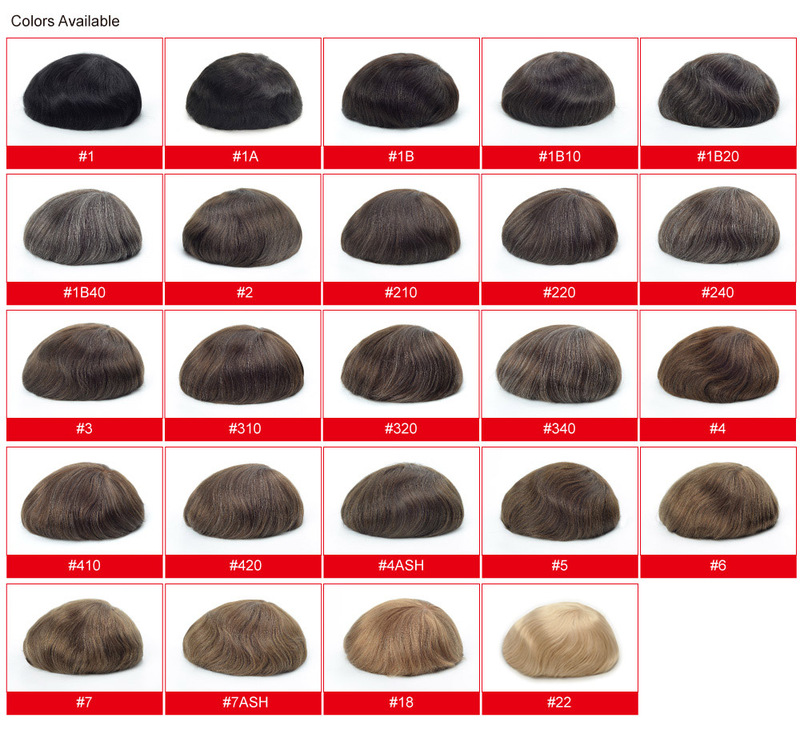 The color of the wigs may vary due to different monitors and screen resolutions. 90 out of 100 men will need a wig or hair system after 45 years of age. Due to changes in diet and lifestyle, a lot of us require it in our twenties only to fight receding hair. Hairpieces for thinning hair help you regain a youthful look and naturally boost confidence. Top quality hair systems from Lordhair provide maximum coverage of bald areas and fullness for thinning hair. In short, our hair replacement products are an idle hair solution for age, gene, & lifestyle triggered hair loss. Our wide range of men hairpieces are doing wonders for both men and women. Made of 100% natural human hair, our hairpieces for thinning hair are completely undetectable, durable, and highly affordable. We have the best hair systems for thinning hair! I've been browsing many hair system websites , watch a lot of Youtube videos and read forums for a week and decided to order my first hair system from Lordhair.com. I got a stock hair system Q6 and using Walker Lace Front Support Tape around the perimeter and Walker Ultra hold adhesive for the front hairline. I do everything myself and really happy with the result! Everything fits well and looks great. I have no complaints at all. Lordhair did an excellent job. I can wear a motorcycle helmet for few hours and also go to the gym work out 3 -5 times pre week with the hair system on without any problem. I've been browsing many hair system websites , watch a lot of Youtube videos and read forums for a week and decided to order my first hair system from Lordhair.com. I got a stock hair system Q6 and using Walker Lace Front Support Tape around the perimeter and Walker Ultra hold adhesive for the front hairline. I do everything myself and really happy with the result! Everything fits well and looks great. I have no complaints at all. Lordhair did an excellent job. 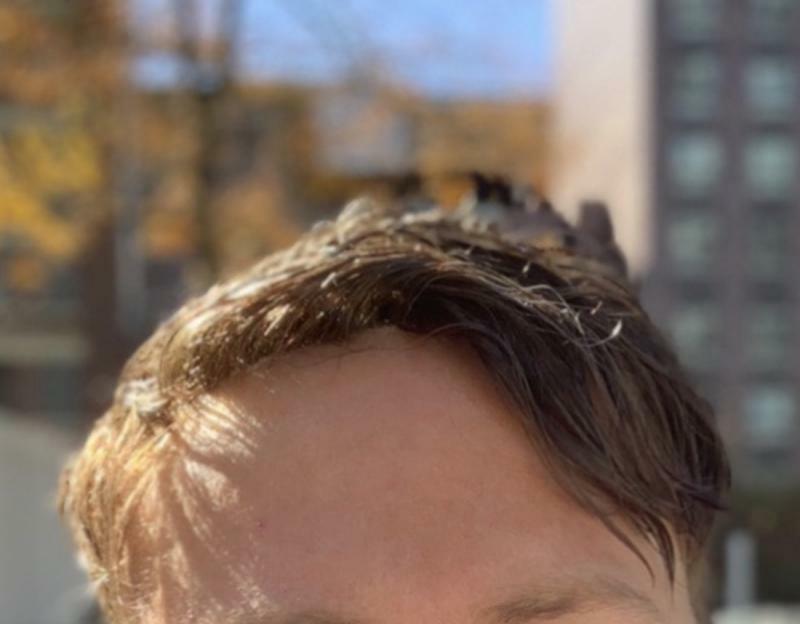 Btw, I can wear a motorcycle helmet for few hours and also go to the gym work out 3 -5 times pre week with the hair system on without any problem. Overall I’m really happy with the Q6 system. The poly sides make a huge difference in the time spent removing glue and the quality of the hair is perfect. As the description says the lace enables the system to be breathable and that’s a huge seller for this unit. That said, it is also what hurts the unit. Unfortunately, to clean the glue you have to let it soak for hours in some sort of goo cleaner which then requires soaking in shampoo and conditioner for hours to remove the stench of citrus. If you’re impatient like me, and decide to speed up the process you will end up with hair coming through. Perfecting the hairline can be a challenge when some of the hair is coming out from the wrong side of the system. - minimal lace in the front and a thin strip of poly around the entire perimeter. This would make cleanup and application much simpler, longer wearability while still providing the breathable unit with realistic hair line.